Find a web-hosting conferencing company. A great web hosting company I’ve used in the past is BeaconLive. 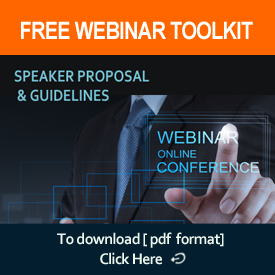 Draw-up a speaker agreement: Outline in detail, the webinar agenda, permissions for materials distribution, rebroadcasting, CD sales, etc. Important: line-up a stand-in in the event your presenter is unable to fulfill the agreement. For more tips on what to include in your contract, go to Meetingsnet. Develop a marketing plan: Schedule various vehicles with specific target dates approx. 6 weeks prior to the webinar. Allow enough time to include an “Early-bird” offer. Schedule a program that includes a weekly e-blast – print advertisements, banner ad and text ad placement. Smartbrief is a great online source for advertising, for a list of industry topics, click here. Important: Include promotional exchanges with partnerships. For additional registrants, tweak your promotional copy for a press release on test PR Web, click here. Produce the Marketing. Compose 2-3 paragraphs of promotional copy with bulleted points outlining specific agenda items. Submit the copy to the speaker for approval. Schedule a Speaker Rehearsal: Set-up a date and time to walk through the speech and associated PowerPoint presentation. For tips, click here. I came across an e-message complete with embedded speaker video announcing the topic and why I should attend. The e-mail/video was created by NetAtlantic, click here to view a demonstration. Is your course worthy of CEUs? Continuing education units provide a record for training to state licensing boards or employers and are calculated based on the number of hours. Almost every profession offers some type of approval process for obtaining CEUs. To see if your event qualifies, search on Google “Apply for CEUs, enter your field.” Here’s an example of a human resources organization, click here. Perhaps you’ll find an organization that offers steps on how to apply for your specific field.